The Rich Firm, PC attorneys and physicians have substantial expertise and experience in obtaining results for patients injured by the negligent administration of Pitocin. Pitocin is a medication that is used to induce labor. Normally, oxytocin produced by the mother signals the uterus to begin labor, and Pitocin is a brand of this hormone. It has the effect of increasing the frequency, duration, and intensity of labor when there is failure to progress. It is also used to induce labor in pregnant women who are past their due dates. However, many women are not aware of the risks. Mothers should be informed of the many potential problems that can occur, and they should have the opportunity to give informed consent. Pitocin is a successful way to induce labor if the mother is past due, but is may be used in situations where it is not indicated. Some physicians may dose the drug improperly, and a real problem may occur if maternal-fetal monitoring is not undertaken correctly and carefully once Pitocin has been administered. If fetal distress occurs, Pitocin, which is given through an intravenous line, should be discontinued. Because it is given steadily throughout the period of induction, contractions may be more intense and more frequent. While it is normal for contractions to result in momentary decreases of blood flow to the infant, the steady stream of Pitocin may result in significant oxygen deprivation. Fetal oxygen deprivation is associated with heart rate abnormalities, retinal hemorrhages, cerebral palsy, seizures, and even death. Other organs are at risk of serious damage. There are additional risks to the mother, which include potentially increased post partum hemorrhage, hypotension (decreased blood pressure), and increase in heart rate, pelvic hematoma (collection of blood in the pelvis), and more ominously, rupture of the uterus or premature separation of the placenta. The study presented at the conference of the American College of Obstetrics and Gynecology found that use of Pitocin was a risk factor for admission to the Neonatal Intensive Care Unit for greater than 24 hours, in full-term infants. Lower Apgar scores of the well-being of a neonate were lower among neonates after use of Pitocin. The conclusions of the researchers, which is the position of the Collge, is that Pitocin should be used with more careful consideration. Careful monitoring of mother and child, with correct dosing, can prevent these problems. 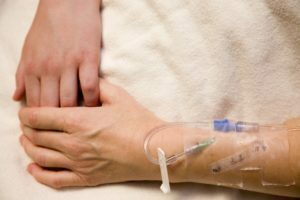 If you have experienced the loss or injury to a child or to yourself, you should seek expert consultation as you may have legal recourse if the fetus was not carefully monitored during labor, or if the drug was improperly dosed. The Rich Firm, PC has medical doctors on staff and they may be able to answer these questions for you.